This just arrived today and I am so excited to sit down and savor every last page. Family dinner was always important in my house. We were expected to be at the table for dinner every night, with the rare exception for a special occasion or request. I don’t remember much about what we discussed or even what we ate (though there always seemed to be a first course of soup involved, no matter the season), I just know it was always there and non negotiable and that it felt like a comfortable routine that I bemoaned but secretly relied on. But yet it has not become habit in MY little family…until now(ish). When I got My Father’s Daughter a while back, Gwyneth talks about how it was only when her son Moses turned three that they were finally able to start having regular family dinners all together and how important the ritual has become in the years since then. It made me realize that even though it’s tough to do in the first few years of your babies’ lives (hence us having neglected it thus far) it doesn’t mean we can’t start setting the table now for the years to come. Right now, Kai is too young to sit through a family dinner. He needs to eat earlier most nights and so we’ve typically fed him and Little D around 5:00pm or so, and then ship them off to bath and bed before we have our meal. In recent weeks, however, we’ve started tweaking that slightly to try to have dinner with D, even if it means us eating a little earlier than we prefer, and her a touch later. And we will keep tweaking it as we need to, to accommodate it as often as we can. And when Kai can make it past 5:00pm without a meltdown and decides to stop throwing his corn all over the floor, we will incorporate him to. And it will be non-negotiable. 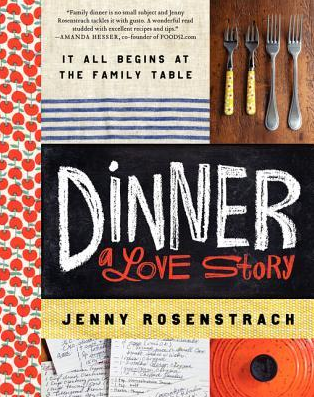 I may not always know what we’re going to eat (though I have a feeling Jenny Rosenstrach is going to give me some great ideas) and I don’t know what we’ll discuss…but my kids will know it is always there. How do you tackle family dinner? I have the Family Dinner by Laurie David. It is a great book with recipes and conversation starters etc. I have not seen Dinner A Love Show, but I will be putting it on my list. I have a 12, 10 and 6 yr old. Keeping those family dinners going is so important as kids approach the teen years. We’ve just been able to introduce the family dinner more – with a 2 and a now 5yo – though it’s often with just The Beans and me, with H coming home later after his long commute. We find, though, that we can manage it well (and adjust timing to prevent meltdowns in all directions) on weekends, when I can more leisurely cook and actual, you know, dinner (vice reheating leftovers, a viable form of nourishment, thankyouverymuch), then sit down together. We even say grace, with the 5you now reminding us – such a lovely thing. Also, soup. The 2yo has inherited his late grandfather’s soup addiction. Ciorba, anyone? Soupa de linta? Yup. It’s our go-to in restaurants with him.